Cerebral palsy, or CP for short, is the most common developmental disability in the United States. There are more than 500,000 people with CP in the United States today. Every year, almost 5,000 babies and infants are diagnosed with the condition. Maybe someone in one of your classes has cerebral palsy — or maybe you have it and you've been dealing with it your whole life. At a time when young people are so conscious of appearance and body image, it can be tough to be in a wheelchair or to have people tease you about the way you walk. But having cerebral palsy doesn't mean a girl or guy can't do what other people do. Cerebral palsy usually is a congenital disorder, which means that it's a problem that develops before or at birth. It can also result from brain damage that occurs in the first few months or years after birth. 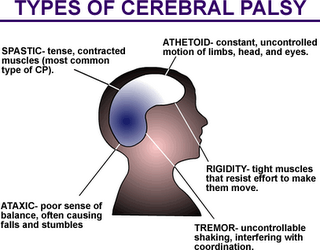 Cerebral palsy is a disorder of the brain that affects a person's ability to coordinate body movements. (This ability is referred to as motor skills.) The condition also affects muscle tone. Spastic cerebral palsy. People with this form of the condition have difficulty moving or their movements are stiff. Between 70% and 80% of people with cerebral palsy have this form of the condition. 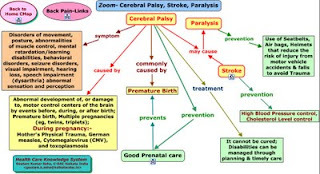 Athetoid cerebral palsy. People with this type of CP have difficulty controlling movement and they may have involuntary body movements. 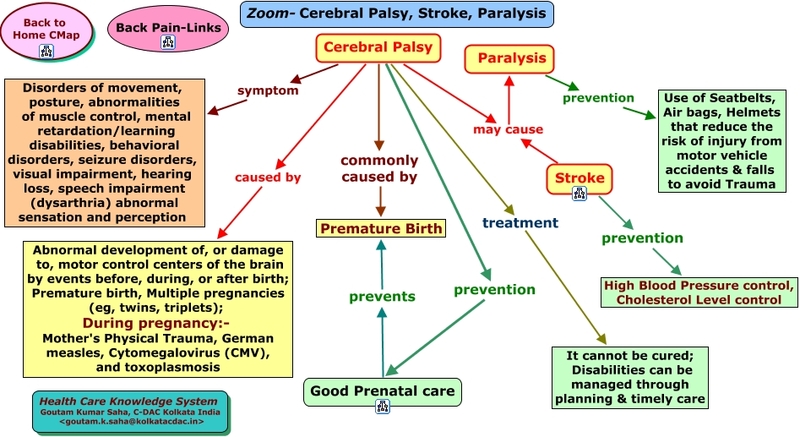 Ataxic cerebral palsy. People with this form of CP have problems with balance, coordination, and depth perception; their movements often seem shaky. People can have one or more of these forms of CP. 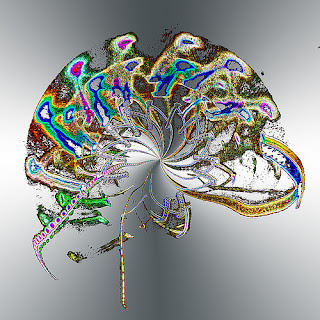 The most common mixed form of CP is a combination of the spastic and athetoid types. Because cerebral palsy affects muscle control, people with CP may have problems walking or eating. Some people with cerebral palsy have learning disabilities or behavior problems, but many do not. Some people who have CP also have other medical problems, such as seizures or epilepsy, hearing impairment, and speech problems. In most cases, doctors don't know exactly what causes CP, but they do know that it's caused by damage to the brain — either while a baby is in the womb or as a result of brain damage in the first few months or years after the baby is born. If a baby is very underweight at birth or doesn't receive enough oxygen during or right after birth, the risk of CP is increased. Babies who weigh less than 3½ pounds (1,588 grams) or who are born prematurely are at risk for developing cerebral palsy. The lower the birth weight, the higher the risk. CP isn't contagious: A person can't get CP from someone who has it or pass it to someone else. Even a mother with CP can't pass it on to her unborn baby. Cerebral palsy also isn't progressive, which means that it won't become worse over time. Doctors can't check for CP with a blood test or a urine test. Sometimes, though, a doctor will do these tests to be sure that some other condition is not causing the symptoms. Tests that scan the brain, such as a CT scan or MRI, may be used to detect a damaged area of the brain. A doctor may order an electroencephalogram (also called an EEG) for people with seizures. An EEG uses electrodes placed on the scalp to record the brain's electrical currents. To diagnose cerebral palsy, a doctor must do a complete examination, paying close attention to a child's muscle tone and strength, reflexes, and coordination. Because CP affects each individual differently, there are lots of ways to treat and manage the condition. People work with their doctors, therapists, and families to develop a treatment plan that best suits their needs. Some people have only mild problems with movement. Others, though, need crutches or wheelchairs to get around. People with CP may go to physical therapy for help with movement problems. They also may go to occupational therapy for help with skills like handwriting or speech therapy for help with speech problems. Some people may have surgery or be given leg braces as part of their treatment. And people with CP often take medicine to help control related conditions, like seizures. What can people with CP do? That depends on the type of CP a person has. Some people are affected mildly, others more widely. But many people with CP can do the same sorts of things that their peers do, like going to college, enjoying extracurricular activities, listening to or playing music, hanging out with friends, reading, going to the mall, and dating, to name just a few. If you're wondering how to treat someone with CP, treat that person the way you would anyone else — with courtesy and respect. Some people with CP might need extra help once in a while, like when reaching for something. If that seems to be the case, you might want to offer to help, and if you have a friend with CP, don't be afraid to talk to your friend about it. People with CP have the same feelings and emotions other guys and girls do. Everyone wants to feel like they fit in, and being in a wheelchair or having other physical problems can make someone feel self-conscious or left out. So if you know someone with CP, try to make that person feel welcome. And if you have cerebral palsy, remember that lots of other people out there are dealing with it, too. It might not be fun to feel different sometimes, but look at everything you do and enjoy and you'll probably discover you're not really that different from other people.